Student 1: Um…like…the ideal man? Smart? Student 2: But not just academically smart—also imaginatively smart. Student 3: It sounds like…what do you call it when people used to work for someone in order to learn how to do their job? Student 3: Yeah! An apprenticeship! 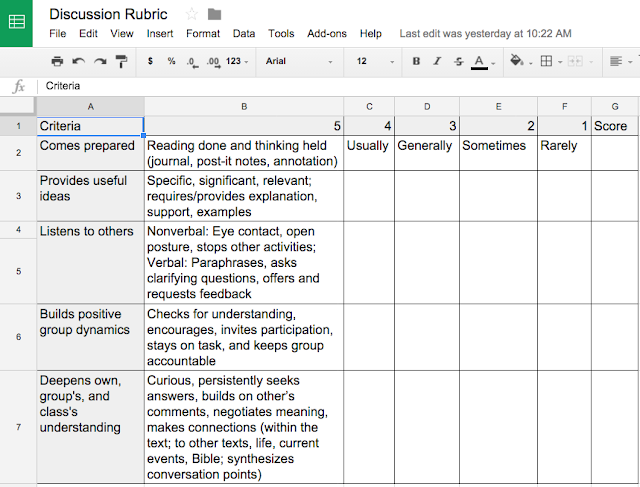 Not just memorizing stuff for a test, but a relationship where the student learns to think and learn like the teacher. At this point I was so excited about what I thought I had just seen happen that I stopped the students and said, “Let me ask some questions about what just happened here. It seems to me like the first person thought her answer was not very good, but since she hadn’t spoken much in the previous round, she figured she needed to jump in and say something.” That speaker grinned sheepishly and confirmed my inference. The light was beginning to dawn on all of them, and I summed it up: “So you don’t have to have the most brilliant observation in order to speak up—it might just be that your ‘obvious’ answer is just what is needed to spark the next thought, which is just what is needed to spark brilliance. And it never would have happened if someone hadn’t started the chain reaction.” They all grinned with the epiphany. Our next discussion, though, on the introductory matter to Narrative of the Life of Frederick Douglass, was less than inspiring—for a variety of reasons. Each person offered up her own response in sequence, but they were all disconnected. No one built on or responded to another. As it happened, that very afternoon I had a book discussion with nine colleagues on Essential Questions: Opening Doors to Student Understanding. 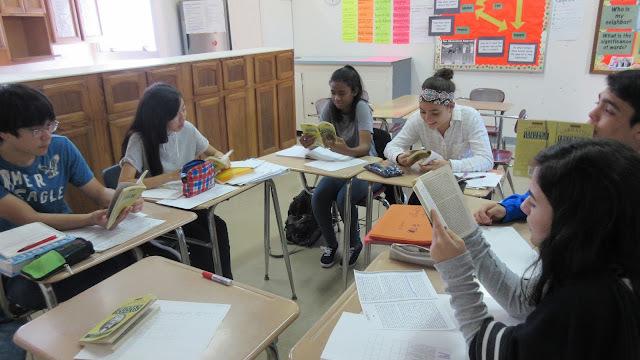 In the course of our discussion, I acknowledged my old bugaboos of being too “nice”—too quick to reward right answers and only probing wrong answers—and I realized I needed to go back to the beginning with my 11th graders and review the purpose of our reading and discussion. 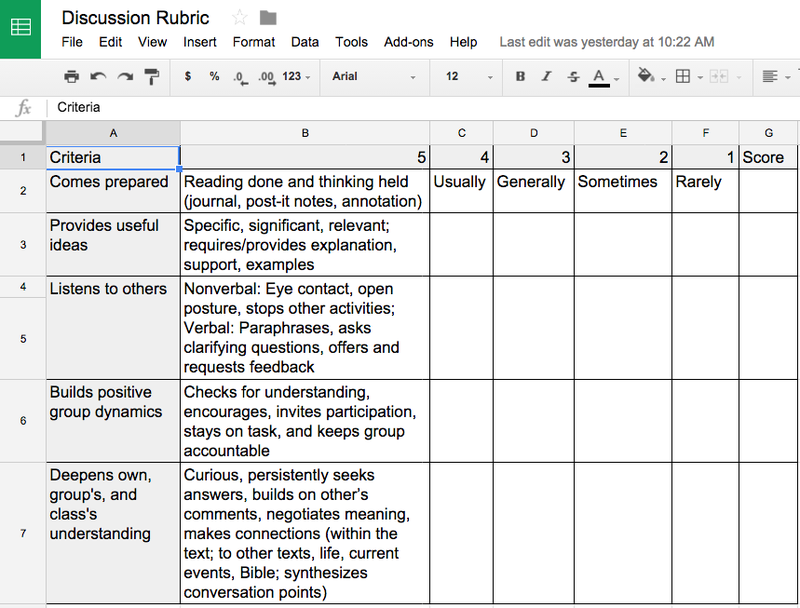 And I handed out the discussion rubric they’d seen before (see below). I asked them just to review it and, in light of the less-than-inspiring discussion of the previous day, set a goal for themselves to make today’s discussion better, to pursue the goal of deepening their own understanding and that of their classmates. “Are we supposed to evaluate yesterday’s discussion?” one student asked. “Oh, no,” I recoiled in horror. “We’re cutting our losses on that one, learning from them, and focusing on doing it better today.” They seemed relieved about that. Then I turned them loose. What a difference! There were questions on background information. There was a wrong statement made, which began devolving into a back-and-forth “yes-she-did”/“no-she-didn’t” war of attrition, which nearly made me give the answer, but I remembered at the last minute to say instead, “Cite your proof.” At which everyone began flipping through their books. The first student to find it began triumphantly reading, then suddenly stopped with an “oh” as she read the words that supported her opponent. Later another student revealed a misunderstanding, and a classmate immediately flipped to a passage that clarified the question. In our debrief on that discussion I told them I was proud of them for speaking up even with questions and misunderstandings--because how in the world are you going to get it right if you don't find out you're wrong? I hope our classroom is a safe place to do that. And I told them I was proud of them for going to the source for evidence, and for helping each other out and building off each other's answers. Sometimes we all—teachers and students—just need a little reminder about our goals and purpose and the best ways of getting there.